Would you like to create a professional-looking certificate but don’t have the design skills or know-how? Well, there’s no need to use fancy software or an online certificate maker. We have more than 100 free, editable certificate templates ready for you to download and customize for any occasion. Browse our collection to find a certificate design that suits your needs; we have samples for participation certificates, gift certificates, award certificates, and much more. Download a template – You first need to select a certificate template that is appropriate for your needs and suits the occasion. Whether it be for the completion of a course, the creation of a gift voucher, or just for fun, simply save the document to your computer and you’re ready to customize it. Insert relevant text – The most prominent text near the top should include the certificate type, e.g. “Certificate of Completion” and the recipient’s name. Other text placed underneath may include information about what the certificate is for, the date that it was awarded and a signature from a relevant representative. Choose your design – Ensure you select a legible font that can be read from a distance, and choose colors that complement your existing branding, including your logo (if applicable). If you wish to use images, you can either upload and insert your own or you can download royalty-free stock images from sites such as Pexels and Freepik. Proofread for errors – Before saving and printing out your certificate, check for any spelling or grammatical mistakes. This will ensure you have a document that looks polished and professional. If you will be producing multiple copies, it is a good idea to first print out a draft to make sure there are no errors and that it is still visually appealing when in hard copy form. 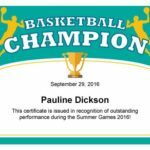 Print and present your certificate – Choosing a high-quality paper or card stock to print your certificate on will ensure you have a final product that looks professional. Choose from more than 100 certificate templates in Microsoft Word to create a professional-looking certificate in a matter of minutes. Templates are organized by certificate type – learn more about a particular certificate and how it is used by clicking on the relevant link. The holiday season is the time of year when we spend the most money on gift-giving, but if you’re stuck for ideas, why not create something unique using one of our Christmas gift certificate templates. Our certificate of completion templates can help you add value to any program – from kindergarten classrooms to employee inductions, from Boy Scout troops to martial arts studios. Recognize competence or celebrate key milestones with award certificates. Whether acknowledging achievement, merit or honor, our award certificate templates are a convenient way to acknowledge others’ successes or show your appreciation for their efforts. Whether you need a specialized document such as a code compliance certificate or a territorial authority form, free downloadable acceptance certificate templates will allow you to show acceptance of a project or service efficiently and professionally. Demonstrate that you recognize the hard work of your employees, students or volunteers using our certificate of appreciation templates. Make the recipient feel special with a personalized memento of their positive contribution. 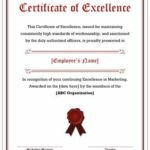 Enhance your employee or student recognition program with a certificate of excellence; a fantastic way to give recognition to your top performers, boost morale and encourage ongoing high achievement. If you run a club, institution or organization, distributing membership certificates will demonstrate your professionalism and enhance the sense of belonging. Offer lifelong memberships or welcome someone into your organization with our membership certificate templates. If you are in the business of exporting goods, you may require a certificate of origin to prove that your goods have been manufactured, produced or processed in the originating country. Download, edit and print a suitable certificate using our certificate of origin templates. If you manage activities, events, training sessions, competitions, or financial exchanges, you may wish to make use of our certificates of participation. Our templates can also be used to demonstrate compliance with a legal or regulatory requirement. Show how much you appreciate those people who have made a valuable contribution or have dedicated their time and skills; we have a variety of recognition certificate samples and templates for you to download and edit. Whether you’re an educator who wishes to show recognition to students, or you’re looking for a unique gift for a loved one, you’re sure to find something suitable from our range of degree certificate templates. If you manage a charity, use our donation certificate templates to show your appreciation of donor contributions in a sincere and professional way. It’s time to get creative and have some using our fake certificate templates. You can duplicate birth certificates, marriage certificates and divorce certificates. You could even create a gag gift or novelty certificate complete with an imitation wax seal. Whatever the occasion, gift certificates are a great way to spoil a loved one and show how much you care. Maybe you want to create a professional spa gift certificate or treat someone to a movie and dinner night; we can help you design the perfect gift voucher. Whether you’re a busy human resources employee who doesn’t have the time to deal with missing or illegible medical information, or a general practitioner who wishes you had more time to explain treatment plans to your patients, medical certificate templates can make your life easier. With our no objection certificate templates, we can help you obtain authorization for such purposes as employment, immigration, travel and building or remodeling. You may be looking to hand out certificates for an in-house corporate training program, for an accredited qualification or as a memento or keepsake.